I read all of your comments and questions regarding the sewing tips post (found here). I will be answering some of the questions in upcoming “sewing tips” posts and will try and leave a comment back at the post to answer some others. Love the eagerness to tackle those sewing machines. Eeeeh. I found a pair of trousers at the thrift store more than a year ago (back when we lived in Idaho) that I wanted to use for this project. My memory is a fragile little thing. It completely forgot that I wanted to make my little buddy a vest. When I dug the trousers out of a stash the other day……..I dropped some other projects and got to work. Typical. But oooooh, I’m so glad I did. Not even a scheduled massage at the local spa, I tell ya. And since we’re going to the trouble……why not make it reversible? 2 vests in 1. Fantastic. And don’t be scared to tackle this one……..they’re only faux pockets. The vest can be worn on either side, buttoned up or down, with a tie, or maybe a bowtie,………or nothing at all. …….he’ll be as cute as ever. And you’ll be so pleased to have used an old pair of trousers. Either way, you’ll be happy. **The tie was made from the tie pattern available in my shop here. 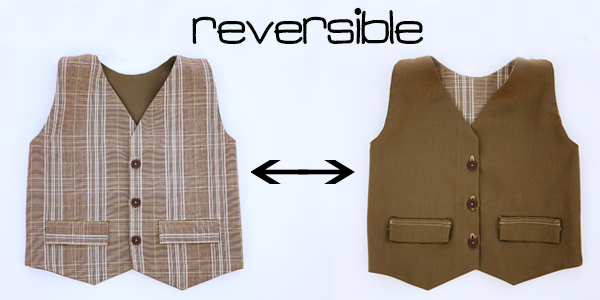 Ready to make your own reversible vest? Here are the thrifted pants from my stash. Do you have some stored away? I also used an old pair of my husband’s dress pants for the inner vest material. I love not spending a penny on fabric! I also measured my son’s torso and decided ahead of time that I wanted the vest to be about 12 inches long. So keep that in mind as you’re making the paper pattern. Then fold this pattern piece in half and trace around the entire thing onto a new piece of paper. This will be used as a reference for your 2 front pieces. Then onto creating the 2 front vest pieces. You can see my original shape in the photo below and then some new adjusted lines around it. extended the inner edge on the left out 3/4 of an inch to allow for an overlap for the buttons (upper arrow on left). measured on my son’s chest where I wanted the “V” to dip on his chest and measured down that far on my pattern, made a mark and then drew a straight line to create a new neck line (upper arrow on right). decided where I wanted the points along the bottom to go on the vest (off center, a little towards the center), measured down an inch from the bottom edge of the original drawing, and then placed a dot to mark my spot (orange circle below). drew 2 lines from each corner of the vest to meet the dot, creating a new bottom edge to the vest (2 lower arrows). If you didn’t add a seam allowance to your pattern piece, make sure to eyeball a seam allowance very carefully as you’re cutting. You don’t want to forget that seam allowance! You should now have 2 main back pieces and 4 front pieces. Next, lay your main back piece face up and then the 2 front pieces face down, line up the sides and sew along each side. Zig-zag or serge to finish off raw edges. Do the same to the inner fabric. Now you have 2 separate pieces……….an outer vest fabric and an inner vest fabric. Lay the 2 section together, with right sides together and line up all the outer edges. Pin in place. Then sew the 2 pieces together along the neck hole, the 2 arm holes, the 2 sides and then along the 2 pointed bottom edges. Leave the straight bottom edge and the 4 shoulder areas open. And clip the curve of the neck……..
**Unsure about why you need to trim corners and clip curves? Read this sewing tip here. Then turn the vest right side out through the bottom opening. Poke out any pointed corners and iron the vest flat, making sure to fold the raw edges of the bottom toward the inside. Now, we need to attach each shoulder piece to create the actual arm holes. If you’re looking at the vest from the front, grab the front shoulder piece on the right and unpick the very top of the seam on the left, a few stitches. Then turn under these raw edges however much you’ve been using as a seam allowance (mine was 3/8 inch) and press edges towards the inside. Pin in place and do to both sides. Then use the same blind-stitch to secure the bottom of the vest closed. Onto the little faux pockets. Cut out two rectangle pieces to be used for the little flaps. Mine were 4 inches wide by 3 inches tall. Fold in half lengthwise and sew along each end (I used a 1/4 inch seam allowance). Then turn right side out, poke out corners and iron flat. Then place the flaps along the front of the vest with the raw edges facing down. Pin in place. Sew a stitch an 1/8 of an inch from the bottom raw edge……..
Then fold the flap over and sew 2 seams near the top, to keep the flap folded over in place. Then add your button holes and buttons. If you’re making this vest reversible…….you’ll need buttons along the other side too. There may be another way to get buttons along each side but here’s what I did. I put a knot in the end of my thread, began the needle at the knot that’s there from the button that’s on the other side, then slid my button on. I stitched through the button like normal but angled the needle as it was coming out the other side, to avoid the button that was on the other side. Then I pushed the needle back through, trying to keep the thread hidden behind the button on that other side, and came out one of the button holes again. I did this a few times until the button was secure. Then, my next predicament was attaching the flaps on this side. I could have just skipped them but wanted to keep the vest uniform. But for me, I made the flaps the same size and the same way, but zig-zagged the top raw edges. Then I folded over the top edge and made the 2 stitches along the top of the flap to make them look like the flaps on the other side. Then I just hand stitched them to the vest, being careful not to go through all the way to the other side. Your little vest is complete. And can be worn on this side……..
Something special for the little fellas. This is super cute, and you made this so easy to follow! Thanks! oops i meant i top stitch around the entire vest for a finshed look whilst closing the centre back opening.. Thank you so much for this tip. Just did it and it worked fabulously! Now I’m going to try not to mess it up with my topstitching and buttonholes! And thanks for the great tutorial. Very clear and for a novice I had no trouble. Just made my little man a matching vest from the fabric I used for my daughter’s holiday dresses. I know this is an old post but I just had to share how helpful it was to me. My husband requested vests for our boys for Easter and he wanted his own to match. I have never sewn with a pattern but after reading the step-by-step instructions I felt like enough of an expert to strike out on my own and even make some changes. My vests turned out SO cute. I had to post as a reply to this comment because I hate hand sewing so I followed the steps given by Jamie to minimize hand sewing. They worked PERFECTLY!! Yes, it is confusing to try to understand the two circles but when I pulled the fabric through there they were. Thank you, thank you, thank you!! This is so adorable. With 3 grandsons, I'm always happy to find "boy" things to sew. Thanks for sharing and the great pictures. Great tutorial! If I had a little guy I would be all over this one! Also, what about sewing the fax pockets on before you start piecing together??? It would save a hadn stitching step. What a fantastically gorgeous little vest (and a handsome little man!). I have two daughters but this looks so great I might try my hand at a girly version! And your model is quite the natural! GQ in his future? So so cute!!! Totally jealous of your sewing skills! he looks great with his tie, his vest and his "coiffure"
I know a little boy who is going to get one of these to wear on Easter:) How cute. Thanks for the tutorial! What a great idea! I I am going to have to try this for my boys, thanks for sharing!! Adorable! Man I need to learn how to sew. Thank you for this. Absolutely adorable. I have your tie pattern from your etsy shop and am always getting compliments on it. I can't wait to make my boys some vests. (I'm a sucker for adorable church clothes)Thank you for sharing. Hip fashions for a little boy or a wee girl with Annie Hall style. Great tutorial – I've added a link to this from my Hip Baby Boutique page at Squidoo. I see you got a serger, What kind is it? ok that is too adorable! And can I just say that your little guy is too cute! So handsome! I don't have any cute little boys but I want to make one for myself!!!! Hmmmm. It might be a bit more difficult due to the chest area and needing darts but it's worth a try! Awesome design! I am SO happy to see a project for the little fellas. I've been wanting to put my boys in vests ever since seeing There Will Be Blood. I can't wait to give this a try. Thank you! Adorable! Perfect for my little guys! This is so sweet and you little guy is just adorable. This is freakin' adorable!! SO CUTE! I definitely want to make some for my boys! Thanks for sharing! ADORABLE! I think my 4-year old needs one of these! Thanks so much for sharing your creativity with us! Your vest is quite cute….but your little man??? DARLING! OH MY GOSH! How cute is he and that vest!! Great job! LOVE IT!!! Thanks for doing a little boy project – I have one boy and another boy on the way and love it when there are crafts for boys :) Thanks! Oh and we're still loving the ties I made from your pattern – by far the best tie anywhere we go! Awesome! Thank so much for posting! so sweet! The little ladybug's would look so cute in one! Love it. How gosh darn cute is your lil fella!!! Gorgeous! And that vest is fab, if my 4 yo stops running madly through the house for long enough I may just attempt that! That is brilliant, and the little guy is so dang cute. I also love the tie pic on your banner. Love your blog! wow! i never knew it took this much more work to make it double sided. you did a great job though. your little man is cute cute! So so cute! I love the vest and I want to make one for my fiance — I'll need some big pants though! Oh wow!! I looked and looked for a vest for my son (he wanted one since his older brother has one) and couldn't find one anywhere in his size! I am totally going to make him one. This is a wonderful tutorial!! Thanks! Wow! How creative. Your pictures and instructions are done so well! I've been admiring your work for a while, but finally have the courage to comment…it's kind of putting yourself out there. So Cute! I can't wait to do this! Love this …. and I shared it with a sewing friend on Facebook! and your young man is SO CUTE! Thank you so much for the great instructions! I am getting ready to make my sons baby blessing out fit and wasnt sure how to make the vest so thank you so much!!! Fantastic. You made it looks so easy.. Love it, thanks for sharing. This is awesome! Very creative! Can't wait to try it. Thank you so much for this tutorial. I have made a couple of vest many years ago but I never felt confident I was doing the shoulders right. I see here you did exactly how I did. I am thankful to see that and now I may try more. What a great project! I'm looking forward to making one of these vests. Your directions were very clear and easy to follow. Thank you for taking the time to make this one of your best posts! Love this and was very very easy to follow! Took me 5 hours but I completed it and I am well pleased! thank you so much for this great tutorial! What a cutie pie. I'll keep this on file for my little boy. I love this tutorial, I'll be using it for my sons Easter vest. Thank you so much for the Tutorial! You make them so easy to follow! I love that you make them reversible, no reason in putting a liner, when you can just wear it both ways! I made 2 so far for my nephews. I posted them here: http://designsbyshandi.blogspot.com/2011/06/reversible-hand-painted-vests.html with a link back to your site! ADORABLE….thanks for the very detailed instructions. They are foolproof for those of us that are beginners! Thanks again! Just need to add some tabs and buttons/buttonholes. Thanks so much! When I saw the date of this post I originally thought, WHAT AMAZING TIMING! But then realised that we are now in 2012… saying that it is a coincidence as I need to make something for my 7mo for a wedding next weekend… with an old pair of work trousers and scrap material from the groomsmen’s ties at our own wedding, I think we are set! I’m glad I stumbled upon your tutorial. I am a Peace Corps Volunteer living in Rwanda. I picked up some igitenge (traditional fabric) from the market because I wanted to have a vest made. I figure that a vest is classier than a lot of the clothing I’ve seen other men wear made from igitenge, which usually ends up looking like pajamas. After reading your tutorial, I think that I am going to go get another pattern and some buttons and make the vest myself. This will be an ambitious project as I have no sewing experience, nor access to a sewing machine. But I am confident in my ability to create! Thanks for a good starting point! you are super mom! You are good! thank god for creative people like you. you truly motivated me to work on another sewing project.!!! love you! i love it! Used this tutorial to make part of my little boy’s hobbit Halloween costume! http://lecaque.blogspot.com/2012/11/halloween.html Thanks so much!! This is a more understandable way of how to make a vest. Thank you for very good explanation. Once I get my sewing machine, I shall make a vest. Thank you so much for sharing. I had gotten stumped trying to do my own reversible vest and your ideas helped me through it. What a cute idea. Thank you so much for such concise instructions. I was able to make a vest for my little boy within 2 tays for his class presentation. I was hesitant at first because I don’t sew much. But talk about a confidence booster. The vest turned out handsomely! Thank you again! A tip for the buttons: use buttons with the same number of holes/spacing and sew them on in pairs. First, knot your thread and stitch through to the “front” side of your vest, slide the front button on the needle as usual and stitch back through the button and vest and pull snug. Your needle will now be on the “back” or interior of the vest. Second, slide the “back” button onto the needle and stitch through the button as for the front button. When you stitch through the vest in this step you will be aiming for the original knot/stitch mark you made in step one, so you go through the hole of the button on the front side. Third, continue sewing through the matching holes of the buttons for all remaining holes and fasten off. Repeat for remaining button pairs. Thanks so much for this great tutorial. I used my own pattern pieces, but I like sewing everything but the shoulders much better than turning rightside out through the sides.